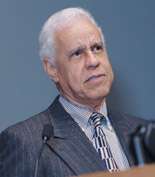 Lawrence Douglas Wilder (born January 17, 1931) is an American politician, who served as the first African American to be elected as governor of Virginia and first African-American governor of any state since Reconstruction. Wilder served as the 66th Governor of Virginia from 1990 to 1994. When earlier elected as Lieutenant Governor, he was the first African American elected to statewide office in Virginia. His most recent political office was Mayor of Richmond, Virginia, which he held from 2005 to 2009. Wilder was born on January 17, 1931 in the segregated Church Hill neighborhood of Richmond. He is the son of Beulah Olive (Richards) and Robert Judson Wilder, and is the grandson of slaves, his paternal grandparents having been enslaved in Goochland County. The seventh of eight brothers and sisters, Wilder was named for the African American writers Paul Laurence Dunbar and Frederick Douglass. Wilder’s father sold insurance, his mother worked as a maid, and while never completely destitute, Wilder recalled his early years during the Great Depression as a childhood of "gentle poverty." Wilder worked his way through Virginia Union University by waiting tables at hotels and shining shoes, graduating in 1951 with a degree in chemistry. 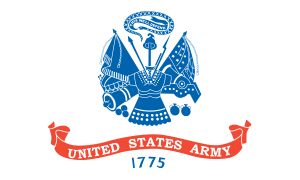 Drafted into the United States Army during the Korean War, he volunteered for combat duty. At the Battle of Pork Chop Hill, he and two other men found themselves cut off from their unit, but they bluffed nineteen Chinese soldiers into surrendering, for which Wilder was awarded the Bronze Star Medal. He was a Sergeant at the time of his discharge in 1953. Following the war, Wilder worked in the state medical examiner's office and pursued a master's degree in chemistry. In 1956 he changed his career plans and entered Howard University Law School. After graduating in 1959 he established a law practice in Richmond. Wilder married Eunice Montgomery in 1958. The couple had three children before divorcing in 1978: Lynn Diana; Lawrence Douglas Jr.; and Loren Deane. 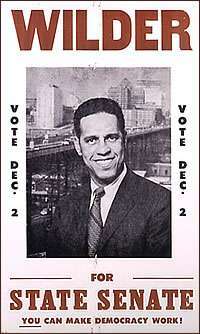 Douglas Wilder began his career in public office by winning a 1969 special election for the Virginia State Senate from a Richmond-area district. He was the first African American elected to the Virginia Senate since Reconstruction. A 1970 redistricting gave Wilder a predominantly African-American district, and he became a liberal in a predominantly conservative legislature. 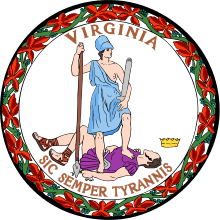 In 1985 Wilder was narrowly elected the 35th Lieutenant Governor of Virginia on a Democratic ticket headed by Attorney General Gerald L. Baliles, the party's candidate for governor. Wilder was the first African American to win a statewide election in Virginia. Aware that he needed to reach the swath of the state's majority white electorate, Wilder had undertaken a two-month "back roads" campaign tour of the state, visiting Virginia's predominantly rural central and western regions and enhancing his name recognition across the state's demographic expanse. Wilder was elected governor on November 8, 1989, defeating Republican Marshall Coleman by a spread of less than half a percent. The narrow victory margin prompted a recount, which reaffirmed Wilder's election. He was sworn in on January 13, 1990 by former U.S. Supreme Court Justice Lewis F. Powell, Jr.. In recognition of his landmark achievement as the first elected African American governor, the National Association for the Advancement of Colored People awarded Wilder the Spingarn Medal for 1990. Wilder had a comfortable lead in the last polls before the election. The unexpected closeness of the election may have been due to the Republicans' strong get out the vote efforts. Wilder had been candid about his pro-choice position in relation to abortion. Some observers believed the close election was caused by the Bradley effect and suggested that white voters were likely to lie to pollsters that they would support him. During his tenure as governor, Wilder worked on crime and gun control initiatives. He also worked to fund Virginia's transportation initiatives, effectively lobbying Congress to reallocate highway money to the states with the greatest needs. Much residential and office development had taken place in Northern Virginia without its receiving sufficient federal money for infrastructure improvements to keep up. He also succeeded in passing state bond issues to support improving transportation. In May 1990 Wilder ordered state agencies and universities to divest themselves of any investments in South Africa because of its policy of apartheid, making Virginia the first Southern state to take such action. During his term, Wilder carried out Virginia's law on capital punishment: 14 executions by the electric chair, including the controversial case of Roger Keith Coleman. During his term, Wilder had strained relations with US Senator and former Governor Charles Robb that many papers described as a "feud." Wilder left office in 1994 because of Virginia's prohibition of successive gubernatorial terms. The next governor elected was Republican George Allen. Since the 1970s Wilder has supported the death penalty. He generally ran on "anti-crime" platforms. In response to a waning budget balance due to state economic problems, Wilder supported some of the most dramatic cuts in the United States in allocations for higher education. In the mid-1990s Wilder was scrutinized for his attacks on fellow Democrat Chuck Robb and support of Republican Mark Earley. Wilder declared himself a candidate for President in 1992, but withdrew before primary season had ended. He briefly ran for the U.S. Senate as an independent in 1994. On May 30, 2004, Wilder announced his intention to run for Mayor of Richmond. Until recently, the Richmond City Council chose the mayor from among its 9 members. The move to change this policy succeeded in November 2003 when voters approved a mayor-at-large referendum, with roughly 80 percent voting in favor of the measure. Wilder was a leading proponent of the mayor-at-large proposal. On November 2, 2004, Wilder received 79% of the vote (55,319 votes) to become the first directly elected Mayor of Richmond in sixty years. Upon winning the election, Wilder communicated his intentions to take on corruption in the city government. He issued several ultimatums to the sitting City Council before he took office. He was sworn in on January 2, 2005. He was a member of the Mayors Against Illegal Guns Coalition, a bi-partisan group with a stated goal of "making the public safer by getting illegal guns off the streets." The Coalition was co-chaired by former Boston Mayor Thomas Menino and former New York City Mayor Michael Bloomberg. On May 16, 2008 Wilder announced that he would not seek reelection to another four-year term as mayor. Wilder has continued as an adjunct professor in public policy at Virginia Commonwealth University. He writes occasional editorials for Virginia newspapers. Douglas Wilder is the founder of the United States National Slavery Museum, a non-profit organization based in Fredericksburg, Virginia. The museum has been fundraising and campaigning since 2001 to establish a national museum on slavery in America. In June 2008 Wilder requested that the museum be granted tax exempt status, which was denied. From that time, taxes on the land had not been paid and the property was at risk of being sold at auction by the city of Fredericksburg. Beset by financial problems the museum has been assessed delinquent property taxes for the years 2009, 2010, and 2011 amounting to just over $215,000. 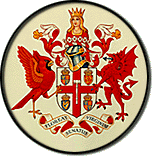 The organization filed for Chapter 11 Bankruptcy protection on September 22, 2011. Early in 2011 Douglas Wilder was refusing to respond to or answer any questions from either news reporters or patrons who had donated artifacts. Wilder made news in 2012 when he refused to support Barack Obama, the nation's first black president, for another term. He noted that he supported Obama in 2008, but said the president's tenure in the Oval Office thus far had been a disappointment. Wilder did not endorse Mitt Romney, the Republican challenger, and later said that he hoped for an Obama victory despite having gone to a Romney fundraiser. In 2015, Wilder published an autobiography called Son of Virginia: A Life in America's Political Arena. In 2004, Virginia Commonwealth University named its School of Government and Public Affairs in honor of L. Douglas Wilder. Wilder serves as an adjunct faculty member at the school. The Virginia Union University library, Norfolk State University's performing arts center, and a Hampton University dormitory are also named after Governor Wilder. Wilder also received an Honorary Doctorate from Arizona State University in 2004. The L. Douglas Wilder Collection resides at the L. Douglas Wilder Library and Learning Resource Center at Wilder's alma mater, Virginia Union University. The collection contains press office photographs from Wilder's time as Governor, over 600 audio cassette tapes of Wilder's WRVA radio talk show as well as other speeches, and over 350 video cassettes of political events, campaign materials, and news appearances. A gallery located in the library also displays many of Wilder's political recognitions and awards. ↑ The first African-American governor of a U.S. state was P. B. S. Pinchback, who was not elected, but succeeded as Governor of Louisiana on December 9, 1872 upon the removal of his predecessor from office during Reconstruction. Deval Patrick, the Governor of Massachusetts, is the second African American to be elected governor, and became the third African-American governor overall. ↑ Untold Glory: African Americans in Pursuit of Freedom, Opportunity, and Achievement Harlem Moon/Broadway Books. 2007. p. 372. ↑ Associated Press, Spokane Spokesman-Review, Virginia Gov. Wilder Running for President, September 14, 1991. ↑ Joe Taylor, Associated Press, Wilder’s Roots in ‘Gentle Poverty’, Ocala. Star-Banner, November 9, 1989. ↑ Virginia Union University, The Wilder Collection: Biographical Information, Retrieved October 5, 2013. ↑ Associated Press, Frederickburg Free Lance-Star, Wilder: Former Governor Now a Candidate for Richmond Mayor, September 26, 2004. ↑ CNN.com, Then & Now: Douglas Wilder, June 19, 2005. ↑ B. Drummond Ayres, Jr., New York Times, The 1989 Elections: The Virginia Contest; Man in the News; Lawrence Douglas Wilder; From Confrontation to Conciliation, The New York Times November 8, 1989. ↑ "Then & Now: Douglas Wilder", CNN, June 19, 2005. Retrieved March 4, 2009. ↑ "Wilder-Robb Feud Heats Up Over Tape". Los Angeles Times. June 10, 1991. Retrieved July 29, 2010. ↑ Ross, Michael (May 23, 1992). "Robb's Career in Peril as Feud With Wilder Heats Up". Los Angeles Times. Retrieved July 29, 2010. ↑ Gould, Pamela (February 21, 2009). "Slavery museum's future in doubt". The FreeLance Star. Fredericksburg, VA. Retrieved December 29, 2010. ↑ Hannon, Kelly (December 29, 2010). "Land Sale Looms for Museum Site". The FreeLance Star. Fredericksburg, VA. Retrieved December 29, 2010. ↑ "Slavery Museum Misses Tax Deadline". Richmond Times-Dispatch. August 14, 2011. ↑ Hannon, Kelly (February 13, 2011). "Slavery Museum Donors Ignored". The FreeLance Star. Fredericksburg, VA. Retrieved August 14, 2011. 1 2 "Nation's first African American Governor decides not to endorse President Obama for President – But He is Voting for Pres Obama". Gretawire. November 5, 2012. Retrieved November 6, 2012. ↑ Laura Vozella (November 28, 2015). "At 84, the Virginia maverick is still bucking". The Washington Post. Retrieved December 3, 2015.